One of my most requested videos is an office tour, so I thought I would supply you with just that today. 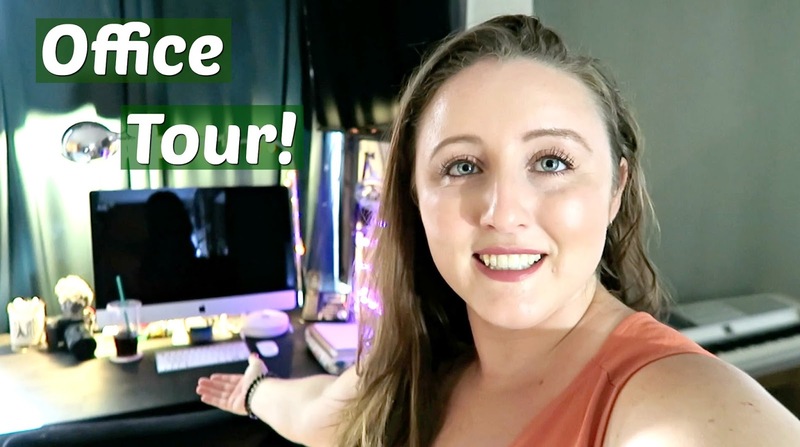 I spent a lot of last week clearing out a lot of clutter and moving a bit of furniture around, so It’s the perfect time to let you all in and show exactly what my home office looks like. This is the view of my office you are all very familiar with as this is where I film my videos. 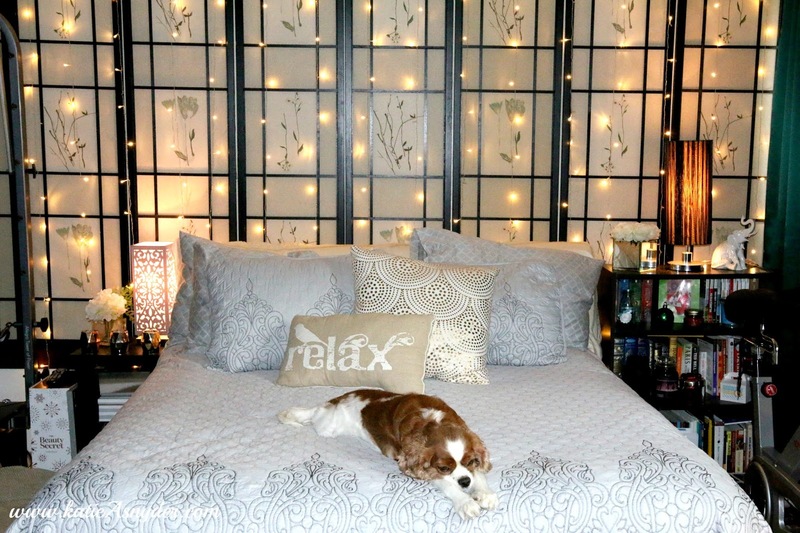 The bed is a queen, and the bedding is from Ross. 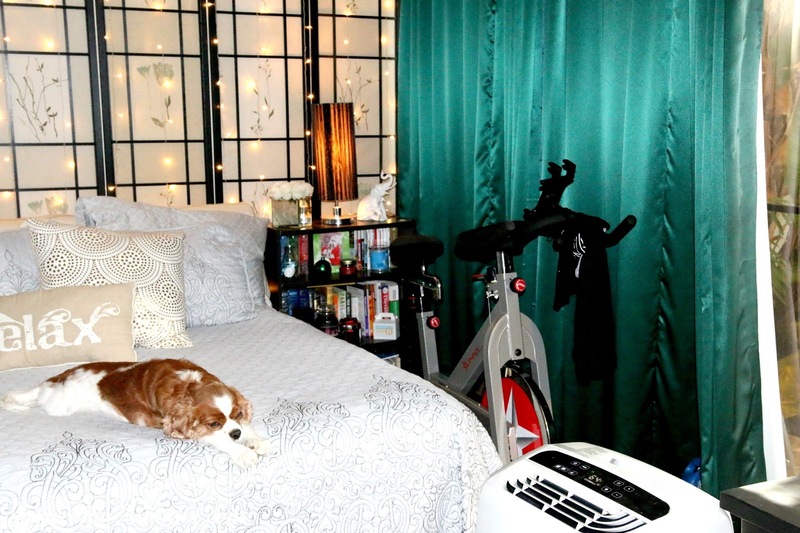 On the right I have my spin bike and my bookcase. The bookcase is loaded down with the books I recently read and the books I would never give away. The bottom shelf is full of my college books, I can’t seem to persuade myself to get rid of them, they were expensive, and seem to hold a bit of sentimental value. Did any of you hold onto your school books? This is my desk, well it’s actually a flatpack dining table, but I wanted a big desk that I can work at. 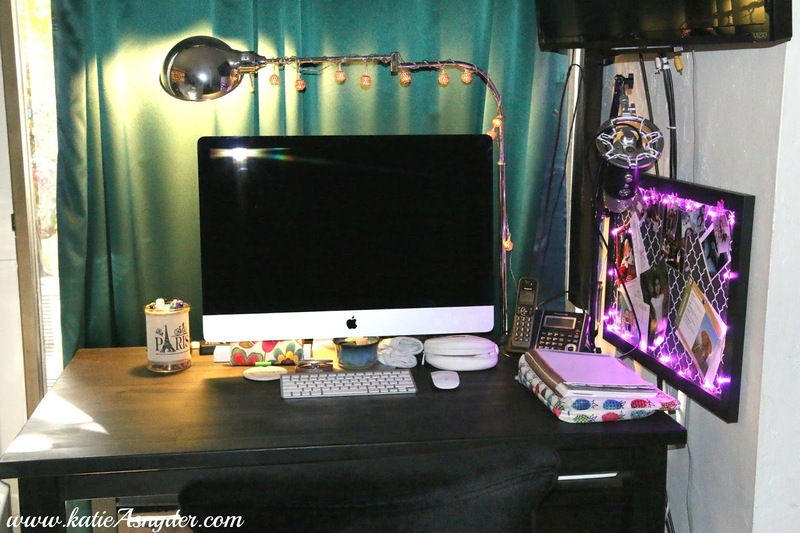 The silver lamp is from Pier One and the bobble lights on it are from Ross, as are the pink lights on my cork board. I try not to keep too much on my desk so I keep 2 notebooks and my Erin Condren Life Planner in a puravida bag, a jar of pens, Beats Headphones, a coaster for coffee, and a jar that I toss SD Cards, USB Drives, etc. I also have my boom mount Blue Yet Mic for recording voice overs. We choose to use portable air conditioners, as our central ac is so old and costs a lot to run, and even more to replace. To the left of the bed I have a nightstand from Ross, and 3 boxes in the nightstand, one has camera cleaning supplies, one has planner stickers, and the other is the empty Micheal Kors candle box for the 3 candles on the stand. 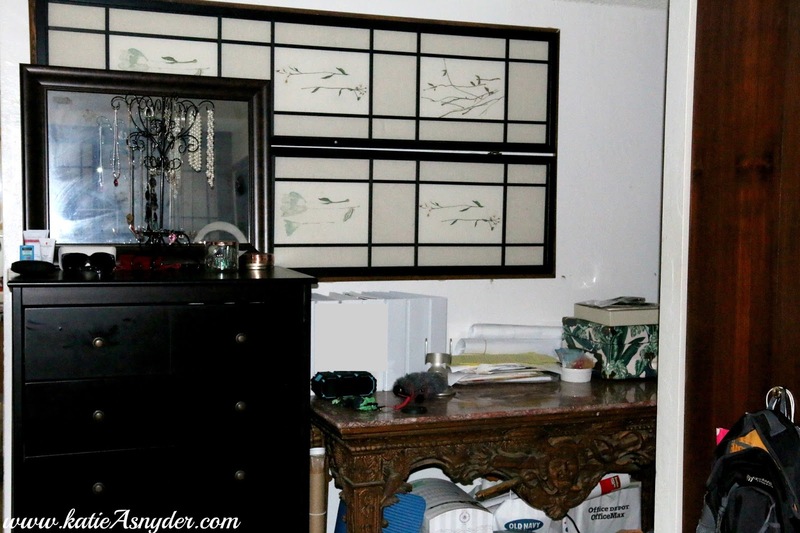 I then used my Advent Calendar box to store all of my piano books next to that. I then have my Pilates Reformer with the Tower Of Power attached. Next to that I have a wire basket that I store wash cloths, gym towels, bath bombs & bubble bars in. I have a smaller stand next to it that stores my camera lenses, bigger tripods, and any other camera equipment. I have my everyday tripod and ring light set up and ready to be plugged in for filming. This is a table that I would rather not be in here, but Don has nowhere else to put it so it’s here to stay. On the top is my record player from Urban Outfitters, and then the rest is his stuff, except for the Rode Mic, I took that off my camera so I could use the flash for these pictures:) I then have my dresser which I keep my jewelry tree and a misc. mirror, along with my sunglasses. And that is pretty much everything in my office. You can see the video version below, it might help to see how exactly it all fits together.